Often recommended by doctors, surgeons, dermatologists and "Camouflage artists" to conceal scar tissue, birth marks, Vitiligo, post-op skin discoloration and other skin imperfections. 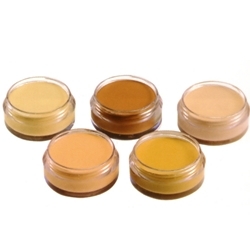 Blends easily on most skin tones. Available in: (CC-1) Ultra Fair, (CC-2) Fair, (CC-3) Medium, (FS-1) Studio, and (FS-3) Olive.